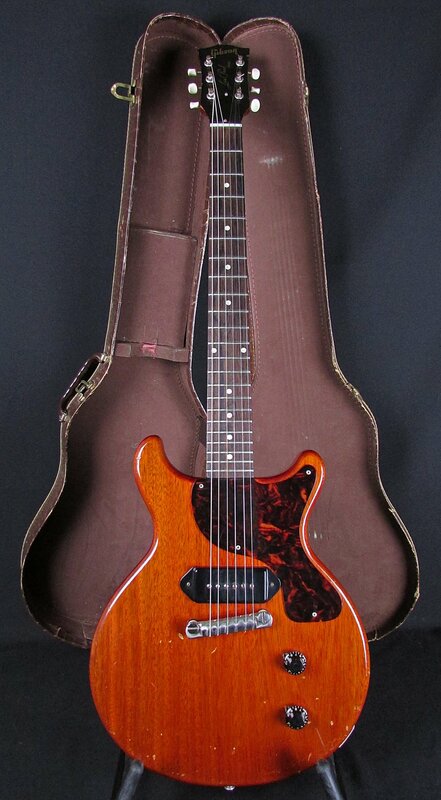 100% original 1959 Gibson Les Paul Junior is in excellent condition and perfect playing order. Comes with the original brown gator skin soft case that's in equally as clean of condition. No breaks, no cracks, no repairs! This guitar is very clean with some light checking and very minor playing wear. A couple dings and dents and chips in the finish around the body but nothing major. A couple tuners are slightly bent, the G and the B string tuners, but it does not effect their functionality at all. Has extremely minimal fret wear, especially for a guitar that's 59 years old! The neck is a killer chunky 59 profile and the pickup screams with it's 7.85k output. Attached to the chunky 59 neck, is a beautifully figured Brazilian rosewood fretboard! This Junior is a true investment quality instrument. Has a 1 11/16" nut width, standard 24 3/4" scale length, and weighs 7 pounds 3 ounces.